NEW YORK, NY and REDWOOD SHORES, CA, May 04, 2015 – Striata, a global specialist in secure electronic customer communications and iSign, a leading provider of electronic signature and other digital transaction management software, recently partnered to incorporate an *eSignature option into the Striata secure eDocument delivery offering. The joint solution enables customers to receive any document requiring a signature, via email and sign it easily from the attached PDF. “By integrating our secure eDocument delivery process with iSign’s world-class eSignature solution, documents are received quicker, signed and returned faster. There is no website registration, usernames or password required. Once accessed and signed, the fully executed document is then sent to both the customer and the financial institution,” explains Mia Papanicolaou, COO, Striata, Americas. For many insurance companies and financial institutions, getting the customer to sign a policy or document requires them to have printed versions in hand or alternatively register on a portal if they provide the option to execute the function electronically. Companies that still send paper communications are burdened with the cost of print, postage, paper and processing. In addition to this, customers are required to mail back signed documents, which results in delays. No website registration nor usernames/passwords required. Mobile optimized for all devices and interfaces. A document is signed within hours, not weeks. Transaction completion times are accelerated, allowing for greater focus on revenue generation. The solution can be easily incorporated into existing document processes. Digital reputation is enhanced by offering great customer convenience. 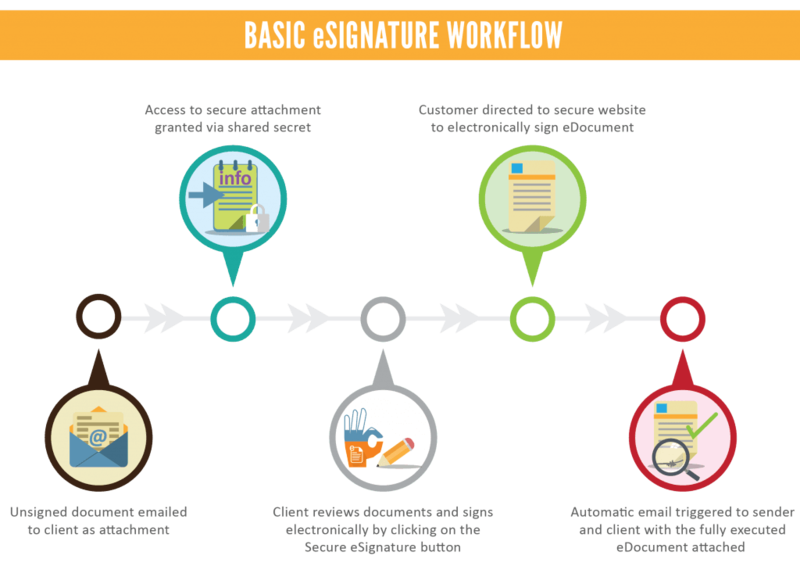 The ESIGN Act confirms that electronic signatures have the same legal standing as pen-and-paper signatures, and a contract or record of transactions may not be denied legal effect or ruled unenforceable simply because it is in electronic form. “We are excited to partner with iSign, a leader in the eSignature market. The integrated eSignature solution will provide our customers with an easy way to get customer signatures in a proven eDelivery process,” concludes Papanicolaou. Striata unlocks the power of email and mobile messaging. Its electronic delivery solutions dramatically increase customer adoption of paperless bills, statements, policies, marketing and other high volume system-generated documents. The world’s largest financial services, utility, insurance, retail and telecommunications companies achieve unrivaled results by replacing print and mail with Striata’s interactive electronic documents and transactional messages. Striata’s enterprise platform, strategy and support services: drive significant paper suppression; deliver ongoing cost savings; accelerate payments; enhance the customer experience and enable regulatory compliance. Striata’s comprehensive solutions expand the digital dialogue through personalized customer lifecycle messaging, retail receipts, notifications and alerts. A global paperless communications specialist with over a decade of experience, Striata has operations in New York, London, Brussels, Johannesburg, Hong Kong, Sydney and partners in North and South America, Europe and Asia Pacific. For more information, please visit our website at www.striata.com. Striata’s logo is a trademark of Striata. iSign is a leading provider of digital transaction management (DTM) software enabling fully digital (paperless) business processes. iSign’s solutions encompass a wide array of functionality and services, including electronic signatures, biometric authentication and simple-to-complex workflow management. These solutions are available across virtually all enterprise, desktop and mobile environments as a seamlessly integrated platform for both ad-hoc and fully automated transactions. iSign’s platform can be deployed both on-premise and as a cloud-based service, with the ability to easily transition between deployment models. iSign is headquartered in Silicon Valley. For more information, please visit our website at www.isignnow.com. iSign’s logo and iSign are trademarks of iSign.